SANTA MONICA, CA – Sometimes SEO gets a bad reputation. Naysayers are correct that there are two types of SEO strategies that are indeed bad for business, and those are gray hat and black hat SEO tactics. Gray hat SEO includes tactics such as reciprocal links, buying old or expired domains, and Google bombing/washing. Black hat techniques are even worse for business and include tactics ranging from keyword stuffing, using link farms, comment spamming and more. Since Google can so easily spot these tactics, why do companies use black hat and gray hat SEO techniques? For starters, those tactics take less time. White hat techniques require creating quality content, careful site optimization, link baiting, guest blogging, internal linking and more. These techniques take a considerable amount of time, which is why to effectively use SEO tactics, you must hire an SEO team with a positive track record. Millionairium only uses white hat SEO tactics because it is the only way to go for successful SEO, according to Ali Husayni, the CEO of Millionairium. Husayni said to heed the warning of Google’s anti-spam strategy as your rankings will rise and fall accordingly to how well you implement the correct SEO strategies. When done correctly, SEO is not spam at all, but a good tactic that Google recognizes, according to Google Software Engineer and head of Google’s web spam fighting team, Matt Cutts. Watch the video below to hear Cutts explain why Google appreciates SEO when done well. A focused SEO plan is a never-ending job, but one that will greatly increase the likelihood that your customers will find you on Google. Contact Us to see if we can provide SEO services for your website. Basic stuff .. it\’s like the minimum one should be aware of when it comes to SEO ..However, there are people charging money for this type of info so newbies should definitely take what you wrote here into consideration. the style is awesome, keep up the good work! or two to grab people interested about everything\’ve got to say. Just my opinion, it could bring your website a little livelier. what way an user able to controlling analytics all own Pages Sites Blog Webpage Weblog LinkBACK UP DAILY AUTO sync? Very informative article. I\’m still learning the basics of SEO. Your\’s site was a great start.A good writing style and information is certainly useful. For all readers continue to write such excellent articles. Thank you.Thanks for sharing this formation. great video.. i learned alot from this video. Fortunately for us, Google has really evolved when it comes to site crawling. Google can easily manage the dirt that black and gray hat SEO had done. I just can\’t get the logic of people using black and gray hat consistently, even though Google can track their work. It\’s like there\’s no way out for them but to be tracked by Google. It just proves that white hat is the most useful and practical way of optimizing one\’s website. Nice blog, as usual, informative and well balanced but easy to understand. Sure taking a long term approach with Google is best. But it is disappointing when you see others ranked ahead of you – one site really annoys me omni-guttervac[dot]com, which is full of hidden text gutter cleaning etc, I sell gutter cleaning equipment and services so feel let down when you see someone using black hat but winning business over you…. maybe its another topic but what can you do about such sites? Also, why have Google Places stopped linking into Freeindex? I think the information you have provided in this article is outstanding and it will surely help most of the business people who read this. It has been seen that Google puts a huge prominence on back links and ranks the websites which have higher number of quality back links. Thanks for sharing this article. Really? I have been trying black hat. 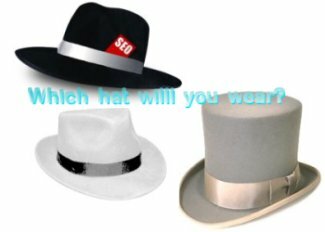 I will stop and use white hat SEO. Thanks for the knowledge. Information like this is why I like to visit your blog regularly.